An arithmetic circuit can be implemented by a number of full adder circuits or parallel adder circuits. 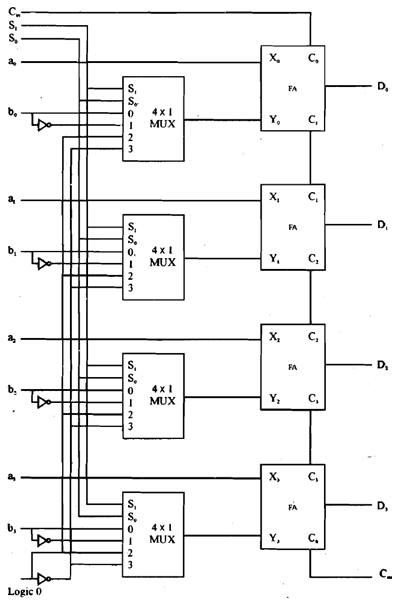 Figure below displays a logical implementation of a 4-bit arithmetic circuit. Circuit is created by employing 4 full adders and 4 multiplexers. 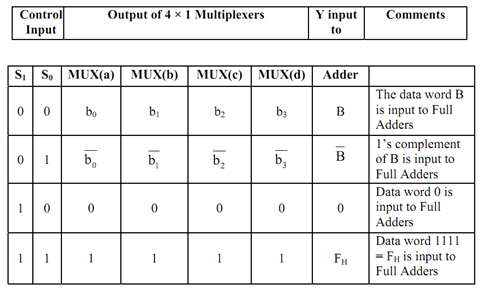 The figure of a 4-bit arithmetic circuit has four 4×1 multiplexers as well as four full adders (FA). Please consider that FULL ADDER is a circuit which can add two input bits and a carry-in bit to generate one sum-bit and a carry-out-bit. Adder just adds three bits. And multiplexer controls one of the input bits. So such combination generates a series of micro-operations. LDAP stands for LDAP- Light weight Directory Access Protocol. What are the ways to truncate guard bits? 1. Chopping 2. Von Neumann rounding 3. Rounding procedure.